Even before the outbreak of war in 1939, a group of American scientists–many of them refugees from fascist regimes in Europe–became concerned with nuclear weapons research being conducted in Nazi Germany. In 1940, the U.S. government began funding its atomic weapons development program, which came under the joint responsibility of the Office of Scientific Research and Development and the War Department after the U.S. entry into World War II. The U.S. Army Corps of Engineers was tasked with spearheading the construction of the vast facilities necessary for the top-secret program, codenamed “The Manhattan Project ” (for the engineering corps’ Manhattan district). 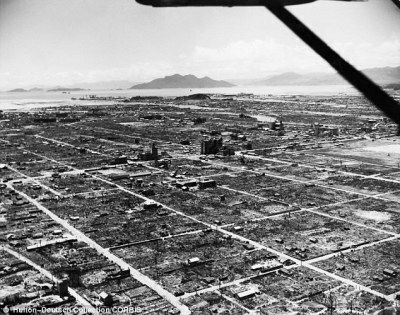 After World War II, most of Hiroshima would be rebuilt, though one destroyed section was set aside as a reminder of the effects of the atomic bomb. Each August 6, thousands of people gather at Peace Memorial Park to join in interfaith religious services commemorating the anniversary of the bombing. Over the next several years, the program’s scientists worked on producing the key materials for nuclear fission–uranium-235 and plutonium (Pu-239). They sent them to Los Alamos, New Mexico, where a team led by J. Robert Oppenheimer worked to turn these materials into a workable atomic bomb. Early on the morning of July 16, 1945, the Manhattan Project held its first successful test of an atomic device–a plutonium bomb–at the Trinity test site at Alamogordo, New Mexico. By the time of the Trinity test, the Allied powers had already defeated Germany in Europe. Japan, however, vowed to fight to the bitter end in the Pacific, despite clear indications (as early as 1944) that they had little chance of winning. In fact, between mid-April 1945 (when President Harry Truman took office) and mid-July, Japanese forces inflicted Allied casualties totaling nearly half those suffered in three full years of war in the Pacific, proving that Japan had become even more deadly when faced with defeat. In late July, Japan’s militarist government rejected the Allied demand for surrender put forth in the Potsdam Declaration, which threatened the Japanese with “prompt and utter destruction” if they refused. General Douglas MacArthur and other top military commanders favored continuing the conventional bombing of Japan already in effect and following up with a massive invasion, codenamed “Operation Downfall.” They advised Truman that such an invasion would result in U.S. casualties of up to 1 million. 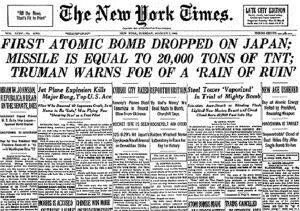 To avoid such a high casualty rate, Truman decided–over the moral reservations of Secretary of War Henry Stimson, General Dwight Eisenhower and some the Manhattan Project scientists–to use the atomic bomb in the hopes of bringing the war to a quick end. Proponents of the A-bomb–such as James Byrnes, Truman’s secretary of state–believed that its devastating power would not only end the war but also put the U.S. in a dominant position to determine the course of the postwar world. Hiroshima, a manufacturing center of some 350,000 people located about 500 miles from Tokyo, was selected as the first target. 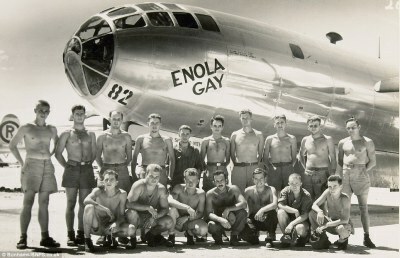 After arriving at the U.S. base on the Pacific island of Tinian, the more than 9,000-pound uranium-235 bomb was loaded aboard a modified B-29 bomber christened Enola Gay (after the mother of its pilot, Colonel Paul Tibbets). The plane dropped the bomb–known as “Little Boy”–by parachute at 8:15 in the morning, and it exploded 2,000 feet above Hiroshima in a blast equal to 12-15,000 tons of TNT, destroying five square miles of the city. Hiroshima’s devastation failed to elicit immediate Japanese surrender, however, and on August 9 Major Charles Sweeney flew another B-29 bomber, Bockscar, from Tinian. 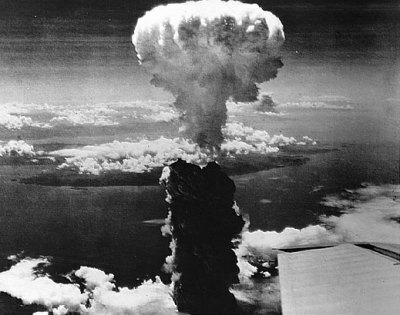 Thick clouds over the primary target, the city of Kokura, drove Sweeney to a secondary target, Nagasaki, where the plutonium bomb “Fat Man” was dropped at 11:02 that morning. More powerful than the one used at Hiroshima, the bomb weighed nearly 10,000 pounds and was built to produce a 22-kiloton blast. The topography of Nagasaki, which was nestled in narrow valleys between mountains, reduced the bomb’s effect, limiting the destruction to 2.6 square miles. At noon on August 15, 1945 (Japanese time), Emperor Hirohito announced his country’s surrender in a radio broadcast. The news spread quickly, and “Victory in Japan” or “V-J Day” celebrations broke out across the United States and other Allied nations. The formal surrender agreement was signed on September 2, aboard the U.S. battleship Missouri, anchored in Tokyo Bay.